Dr. Charles S. Finch is Director of International Health at the Morehouse School of Medicine. He was graduated from Yale University and Thomas Jefferson Medical College. For 2 years, he was an epidemiologist with the Center for Disease Control. When Dr. Finch joined the faculty of the medical school in 1982, he directed its clinical programs and coordinated the geriatric teaching program. 7 Years later, he joined the medical school's International Health Office and became involved in a public health training project in Senegal. Since 1982, he has led groups to traditional healing ceremonies in Senegal. Dr. Finch has published in excess of a dozen articles on African antiquities, comparative religion, anthropology and ancient sciences resulting in a collection of essays entitled " The African Background to Medical Sciences " Echoes of the Dark Land: Themes from the African Eden. " Africa and the Birth of Science and Technology (A Pamphlet.) In addition to being a prolific lecturer, he has led 5 study tours to Egypt. He was named a board member of the Senegal-based Association to Promote Traditional Medicine in 1995. 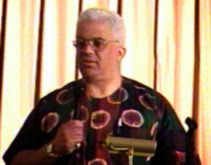 Dr. Finch was the Co-Chairman of the 1994 Nile Valley Conference at Morehouse College.